All the verse-by-verse insights of the 12-volume Expositor’s Bible Commentary—in 2 convenient volumes. When you want to dig more deeply into the meaning of God’s Word, a good expository Bible commentary is ideal. You want more than a simple, one-volume commentary that just scratches the surface. But you don’t want a time-consuming multi-volume set laden with fine points you can’t use. 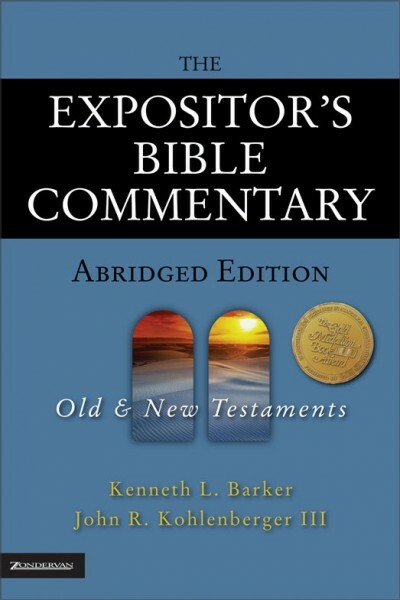 The Expositor’s Bible Commentary Abridged Edition is tailor-made for you. Based on the critically acclaimed Expositor’s Bible Commentary used by pastors, students, and scholars across the world, this two-volume abridged edition offers you the full, penetrating, verse-by-verse commentary of the 12-volume series while leaving out needless technical details. Marshalling the knowledge of fifty-two top biblical scholars, it brings tremendous insight to your Bible studies. Covering the Old and New Testaments, this commentary features verse-by-verse exposition of the entire Bible.